The bus full of students trying to reach the Home Ministry was halted, the police compelled the students to get off the bus and even beat up some of the students. 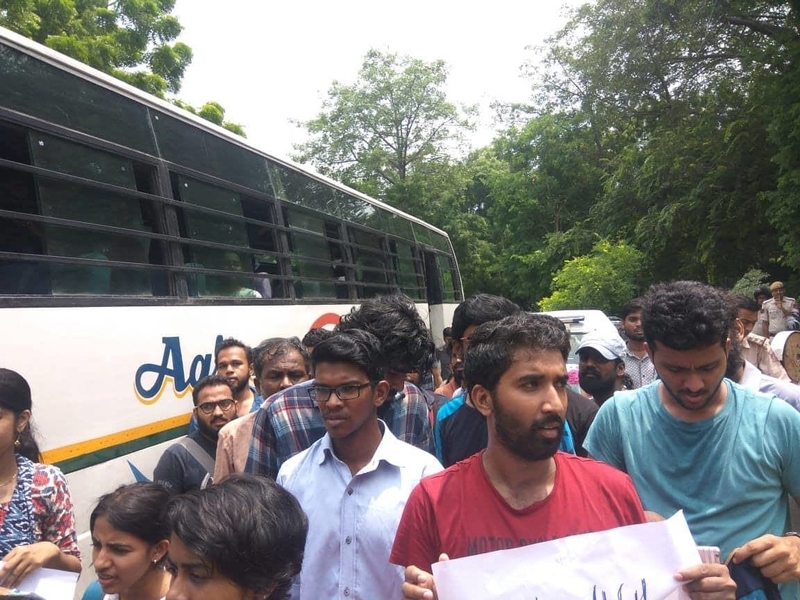 Students Marching Towards Home Ministry Against Insufficient Action On Kerala Floods Detained And Beaten Up The bus full of students trying to reach the Home Ministry was halted, the police compelled the students to get off the bus and even beat up some of the students. Students from Jawaharlal Nehru University (JNU) had issued a call for a protest march towards the Home Ministry on Saturday morning following the Kerala floods. The students hoped to create pressure on the government to do more to contribute towards the relief measures in the state and to declare it as a national calamity. Post this, the students decided to stage their protest in front of the Kerala House at Tolstoy Marg. Sreelakshmi from JNU confirmed that there was heavy police presence and the students are surrounded by officers not just from Delhi Police but the CRPF too. “The police also brought their own DTC bus, they have surrounded us. We are not sure where they will take us and we might be detained. They want to prevent us from protesting. The officers are double in number (than the students),” she said. The officers then isolated the male students and attacked them. Sreelakshmi also told that some of them were beaten up by the police and mishandled during the detaining process. The female students were put in a separate bus. Currently the students are being taken to the Parliament Street Police station. Kerala is currently under the wrath of floods and with the death toll in the state crossing 320, painful testimonies of people losing their houses and families are emerging. The state is facing shortages of food, water and medical supplies across its 14 districts. With thousands awaiting rescue, the centre, has failed to do its duty till now. Prime Minister Narendra Modi took stock of the situation through a helicopter yesterday, post which the center had announced a financial package of Rs. 500 crore. The Kerala Chief Minister, Pinarayi Vijayan had appealed to the Prime Minister for an immediate relief amount of Rs. 2,000 crore. The estimated damages across the state as informed by the chief minister is approximately over Rs. 20,000 crore. Previously the center had announced a relief fund of about Rs. 100 crore after Home Minister Rajnath Singh had visited the state on August 12. *Note- This is a developing story, more details will be added.